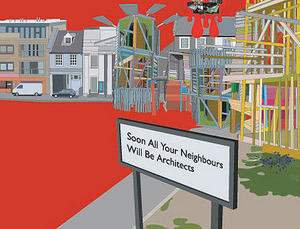 Nils Norman, The Homerton, Playscape Multiple Struggle Niche, 2005, preview card. Via Archinect. Many people today are stimulated by Buckminster Fuller's post-war dome technologies, as well as other 1960s and 1970s-era shelter designs, to radically rethink architectural structures, both as a practical solution to urban housing crises and as a key historical trope of innovative "guerrilla" architecture. 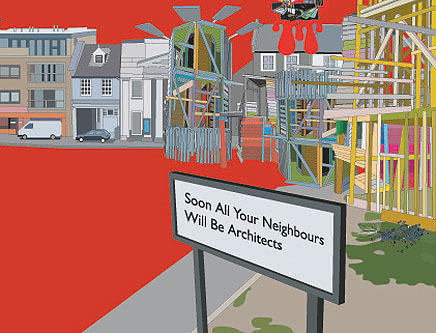 The difference today: gone is the frontiersman logic of back-to-the-land, drop-off-the-grid, atomized micro-environmentalism... What enters instead is a proposition of sculptural structures as temporary interventions in urban sites, of kiosk production and shelter-information display hybrids.